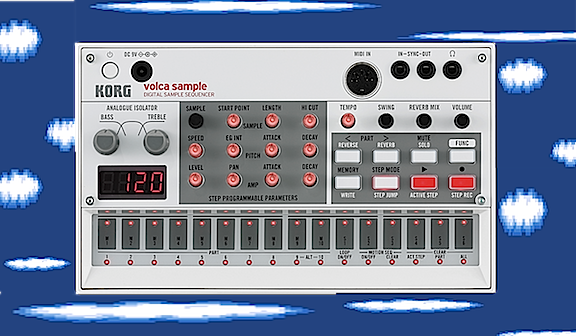 The Volca sample is the latest device in the Korg Volca range and I believe this could be the device which allows the individual the ability to make complete tracks on its own. However, If you use this device with the Volca keys then you should be able to make an track with only these two instruments which stands out as a high-quality piece of music and combines the rigid sounds of the sampler with the more organic and synthetic sounds of the Volca keys. Here are some suggestions on how to use the Korg Volca sample with the Volca keys, so as to create a complete whilst on the go. If you have the Volca sample and the Volca keys synced together you can create a melody with the keys and then use the sampler to create a drumbeat. However, the sampler can also be used to load the sounds and it is a common technique in many forms of music to use three elements at any one time. For instance, you could create an intro melody and save it in the first slot on the keys and create an intro drum beat on the sampler. You could also have a sound effect which begins at the start of the sequence which is triggered from the sampler. You could then move onto the second slot in each device and create a verse style sequence which has a bass line from the keys and a drumbeat from the sample. You can also add a new sound effect which is triggered at the beginning of each sequence on the sampler and which creates a sense of energy (such as an explosion). You could then create a another melody in the third save slot on the keys which is a variation of the bass line and has less of a looping style in the sequence. You could then create a new variation of the drumbeat in the sampler and include an atmospheric pad sound which would lead to a sense of euphoria and atmosphere. Finally, you could create an ambient breakdown in the fourth slots which could be used, before looping back into the verse and the chorus sequences. This could then be played live once it is saved and be recorded into the sequencer, by treating the sequencer like a multitrack recorder. If you wanted to use the keys and the sampler to create a single loop which you then recorded into the computer and sequence within the sequencer so as to create an entire track, then this would also be possible. in this situation you may wish to use the keys in order to create a dynamic baseline, and then use the sampler to create the drums and a selection of other patterns which would then be played throughout the track. You could then create up to 8 of these and save them within the various slots on the devices. Once these programs are in place you can then connect the devices via the line input into a recording device such as a computer and record each layer individually. Once the sounds have been recorded, you could then import the loops directly into a sequencer, adjusting the tempo of the sequencer to the tempo shown on the sampler when you made the loop. You could also chop each loop into individual notes and then re-sequence these within a sequencer if you wanted to created more variations to the sequences.